Jewish rights groups angered after BBC interviewer claims 'Palestinians are suffering at Jewish hands' during Paris rally. BBC reporter Tim Wilcox was interviewing a French Jewish woman - who is also the daughter of holocaust survivors - at the Paris mega rally, held after Islamist terrorists murdered 17 people in a string of attacks, including at a kosher grocery store. 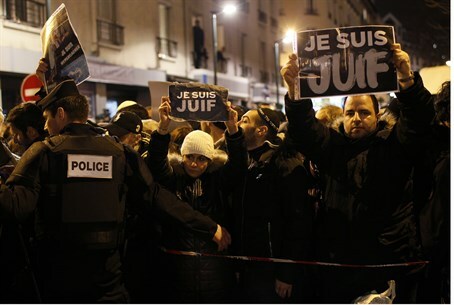 The latest attack on France's embattled Jewish community has left French Jews feeling understandably shaken, yet after hearing the woman's fears that Jews are being targeted in Europe, Wilcox interjected, saying: "many critics though of Israel's policy would suggest that the Palestinians suffer hugely at Jewish hands as well." His interviewee, clearly taken aback by the question, begins to respond by telling him that the two issues aren't comparable, at which point Willcox interrupts again: "but you understand everything is seen from different perspectives?" It is not the first time Wilcox has been accused of anti-Semitism. Less than two months ago, during a live daily review of the morning's papers hosted by Willcox, one of his guests claimed that a "Jewish lobby" was trying to subvert Labor party leader Ed Milliband's "principled" support of a controversial, symbolic bill to recognize "Palestine" as a state, by pulling funding for his election campaign. Instead of calling out his interviewee for invoking an anti-Semitic trope, Willcox not only concurred, but added his own, commenting that "a lot of these prominent Jewish faces will be very much against the mansion tax" which Milliband supports. Watch: BBC interview discusses "Jewish lobby" and "rich Jews"
The Campaign Against Antisemitism, a grassroots initiative formed several months ago to combat rising anti-Semitism in the UK, has called on British Jews and BBC viewers in general to lodge an official complaint on the BBC's website against Wilcox's "disgraceful" comments. "Tim Willcox’s latest statement to offend Jewish viewers is that the Palestinians 'suffer hugely at Jewish Hands'... only weeks after he suggested that 'prominent Jewish faces will be very much against the mansion tax,'" noted Jonathan Sacerdoti, Director of Communications at the Campaign Against Antisemitism. "This latest statement was made in response to a Jewish woman in Paris telling him that the situation there reminds her of 1930s Europe. It was a disgraceful slur given that four Jews had been massacred in a Jewish supermarket just two days earlier." "The BBC denied there was any antisemitic intention behind his November statement, but we are continuing to pursue our complaint with them regarding this. Our lawyers are now preparing a new complaint," Sacerdoti continued, slamming the BBC for continuing to allow him to broadcast despite his questionable record. "Tim Willcox is becoming a frequent offender of Jewish viewers and the BBC needs to deal with this issue urgently. Does he have a problem with Jews? So much for BBC impartiality!" The BBC itself has been criticized by some groups, including the Campaign Against Antisemitism, for fanning the flames of anti-Semitism in its one-sided portrayal of the Arab-Israeli conflict. In particular, after the BBC's own director of television - who is himself Jewish - revealed that he had "never felt so uncomfortable being a Jew in the UK" due to a dramatic spike in anti-Semitism over the summer, Sacerdoti suggested he consider what role his own company had played in stirring that hatred. "Many suggest that the BBC has contributed to the rise in anti-Semitism in the UK and beyond, through its slanted news coverage. We will have to see if Mr. Cohen is able to contribute towards turning that tide, despite his putative separation from BBC News," he fired.